Lessons about business from working at a B-movie studio. What can you learn from the cult classic The Toxic Avenger? This week Jeff Sass, who cut his teeth in the movie business at Troma Studios, talks about the business and marketing lessons he learned while working for the studio known for creating B-movies including The Toxic Avenger. 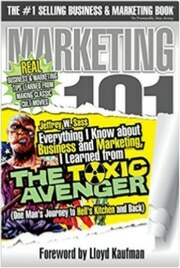 Check out his new book Everything I Know about Business and Marketing, I Learned from THE TOXIC AVENGER: (One Man’s Journey to Hell’s Kitchen and Back). Also: Zak’s two UDRP wins, .Asia opening up, Sedo partners for new escrow option and Rightside’s two-letter domain names. Want a copy of Jeff’s book? The first three people to post a comment below asking for the book will get a copy. I’d love a copy too Jeff.. I think if you make your “passion” your job, that can often backfire. Is it truly a passion if you turn it into a business? I’ve sent the email addresses for the first three commenters over to Jeff. Enjoy the book! I’d love a copy too if one or two of the above don’t qualify for posting anonymously or without their name or a link to who they are! Fun interview. Jeff, you should consider making this an audio book. You’re a engaging story teller!